Wavin’s Product Manager for Foul, Utilities and Water Management, Martin Lambley, outlines the different types of inspection chambers on the market today, where they likely to be are used, and the regulations governing them. At one stage or another, most plumbing professionals have been called out to a job that involves accessing or assessing a drainage system via an inspection chamber. And while they aren’t something that most professionals will find themselves tasked with installing, it’s worth understanding the process that goes into chamber selection, to ensure you’re well versed in what to expect next time you’re working on anything from a drain unblocking job to a full-scale bathroom extension. An inspection chamber enables access to underground drainage systems, ensuring they can be inspected regularly, and cleared in the event of a blockage. Historically, these access points were large brick-built or concrete manholes that individuals would physically enter to carry out essential works. More recently, the design has changed to keep safety in mind, and inspection chambers are now more suited to equipment such as jetting rods and CCTV only. Furthermore, these chambers are more regularly constructed using polypropylene, a thermoplastic polymer with a high chemical resistance. Not only does this make them suitable for sewer applications, it also makes initial installation easier and more efficient. For most buildings, it’s likely that at least one inspection chamber will be installed in an underground drainage system. There are four different instances where inspection chambers are required: at the head of a run; when there is a change in direction or gradient; at, or near to, a junction; and when there is a change in pipe width. Having inspection chambers at each of these points ensures the entire system can be accessed. This is essential for both regular maintenance and unexpected repairs. Inspection chambers are available in a wide range of sizes to suit a multitude of applications. More often than not, they are made up of three different components – the base, which has inlets and outlets through which waste will run; the shaft, the length of which varies depending on the installation; and the cover and frame, which covers the chamber and keeps it secure. While there are some variations in size, type and application to each of these components, it is inspection chamber bases that divide opinion amongst below ground drainage specifiers. Some prefer to select bases with multiple inlets and outlets, so the product can be used across a site in various situations. On the other hand, there is a school of thought that it is more efficient to use a base with the exact number of inlets and outlets. The concern is that where not blocked correctly unused inlets where there is no pipework connected could impede the flow of the system, and quickly result in a build up of debris, further disrupting system effectiveness. Such niches also provide a handy home for rats and other vermin. Needless to say, while there are two varying opinions on inspection chamber bases, the key considerations that drive most selections are strength, design and quality. The main documents relating to the selection and installation of inspection chambers are Part H of Building Regulations and Sewers for Adoption 7 (SfA7). Both documents allow for the use of plastic inspection chambers in both shallow and deep (up to three metres) applications. While Part H governs round-the-house drainage, which is under the ownership of the householder, Sewers for Adoption applies to sewers or drains that serve two or more properties. More often than not, these systems will be adopted and maintained by the local water company. In both documents, the requirements for whether the inspection chamber should be shallow or deep and the performance level required is clearly laid out and is based on a range of safety and usability factors. In essence, inspection chambers must pose no risk to human life should someone fall in, whilst offering the most effective point of access for inspection and maintenance. It is also essential that any inspection chamber, be it shallow or deep, conforms to the relevant British Standards. 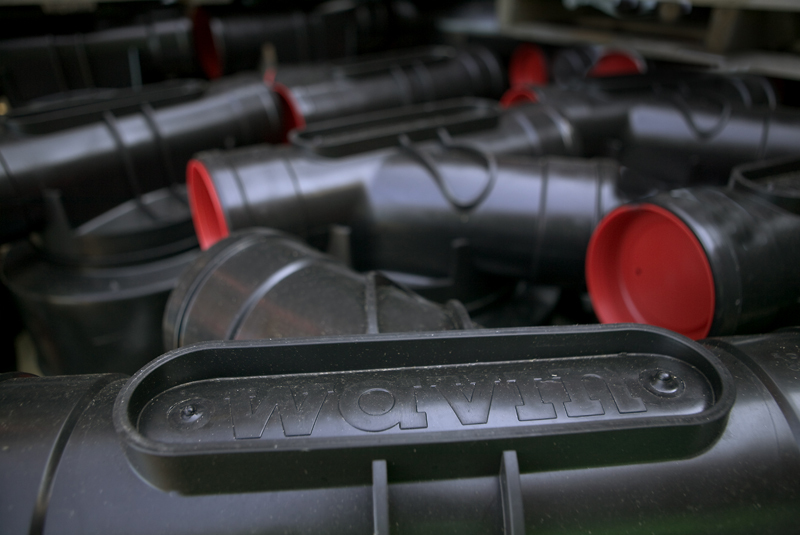 For those regulated under Part H, this is BS 7158:2001 – plastics inspection chambers for drains and sewers (specification), while Sewers for Adoption requires BS EN 13598 – plastics piping systems for non-pressure underground drainage and sewerage (the latter having superseded the former). Part 1 of BS EN 13598 applies to shallow applications, and part 2 applies for deep applications. Wavin’s online Chamber Selector Tool offers even more detail on the different types of inspection chambers and components available, and their applications. Visit myportal.wavin.co.uk/tools/chamber to find out more.